I have watched 7 or 8 episodes of "Doomsday Preppers." At first, I thought it would be a good show. After watching several episodes, I changed my mind. I think Nat Geo's goal is to make anyone who thinks preparing for bad times is a good idea out to be a nutcase. I'm not making any judgments about the people featured on the show. I think the show is certainly slanted to make these people look crazy. While there are definitely people who call themselves "preppers" that are extremists, and some that are probably mentally unstable, you'll find that in every segment of the population & not just in the preparedness community. To say that the people on Doomsday Preppers are "typical preppers," is like saying that the people on Jersey Shore are "typical Americans." The word "prepper" means different things to different people. To some it means having a few weeks of food & water stored up in case of a natural disaster. To others, a full year's supply of food for their family. Some people think they're prepared if they have a case of MRE's, their trusty rifle, and a couple thousand rounds of ammo. There is no exact definition. 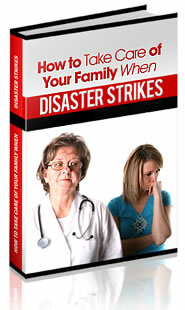 Everyone has to decide for them what level of preparedness they are comfortable with for their own family. I think preparedness is a lot more than just having stuff. It's a way of living. Trying to be responsible for yourself & your family, & doing the best you can to be able to take care of yourself if something bad comes along. I'm not looking for "the end of the world." If the end of the world comes, then we're done anyway, so who needs to prepare for that? A zombie apocalypse? An entertaining TV or movie idea maybe, but not likely to happen. But there are natural disasters that happen all the time all over the world. Our economy is already in bad shape. Anyone that thinks it can not or will not get worse is naive at best. Terrorists are not just overseas anymore. Plain & simple – bad stuff happens to good people everyday, all over the world. If you do not feel the need to prepare for hard times or disasters, that is your choice. But if something bad happens, you (& a lot of other people) will be at the mercy of someone else to come to your aid. If you are planning on FEMA, or some other government agency to rescue you, you may want to work on a little better plan. Even FEMA will tell you that you should not expect any help from them for at least 72 hours, & that you should be prepared to take care of yourself & your family for at least that long. If you live somewhere that is exempt from the possibility of any natural or man-made disaster, please let me now where it is, because I'd like to move my family there! Being a prepper does not require that you be crazy, as Doomsday Preppers would have many people believe. What it does require is some level of responsibility for yourself, and your family. Not relying on the government, or the kindness of others to get you through hard times, when you could have done it for yourself. It requires that you have a desire to have some level of self-adequacy, and to be able to overcome those hard times, whatever they may be. Those people who refuse to be responsible enough to take care of themselves just become part of the problem. Any time there are large scale emerging, first responders become overwhelmed quickly. If your entire plan is for someone else to come rescue you, you may be waiting quite awhile! My opinion is that anyone who really thinks that nothing bad could ever happen to them is naive, arrogant, and irresponsible. The America we grew up in is gone forever. In some ways that's good, in others, it's bad. We have many more changes coming, and I feel that a lot of them will not be good changes. I think as individuals, we need to do everything we can to prepare for those changes. We need to do all we can to protect our families from hard times. We need to develop friendships & build communities of like minded people, so we can work together and help each other. The people that prepare & work together will make it through the rough times, just like they always have. Those that do not may find themselves in less than desirable circumstances.